The Market is Spooked Out! But You Shouldn’t Be. The U.S. and Canadian stock markets have declined about 8% and 9%, respectively, from their 52-week highs. They’re spooked out from the Halloween month! Let’s take a step back and be objective. The U.S. market is still about 29% higher than three years ago. The Canadian market? About 12% higher. From five years ago, the U.S. market is 52% higher and the Canadian market is 15% higher. You get the big picture. The stock markets go up over the long term. Historically, it has always been money-making opportunities to buy quality companies on dips. And this dip is no different if you find great businesses to be attractively priced. Here are some North American dividend-growth stocks that I find compelling today. AbbVie (NYSE:ABBV) offers a safe 4.7%. Its payout ratio of less than 50% is sustainable. Since AbbVie was spun off from Abbott Labs (NYSE:ABT) in 2013, it has increased its dividend every year thereafter. Its four-year dividend growth rate is 13.2%. Its trailing 12-month dividend per share is 40% higher than the previous 12 months. 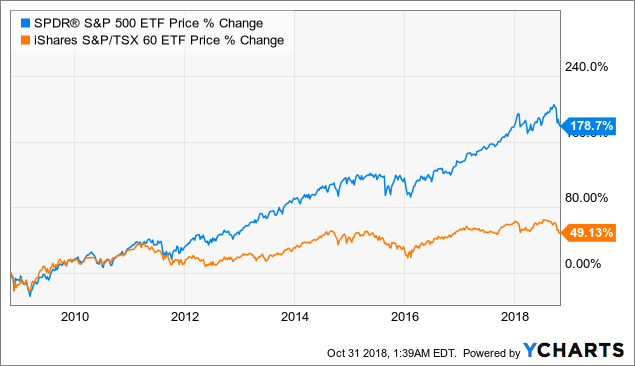 This entry was posted in Dividend Ideas, Dividend Investing, Dividends & Income, Investing, Retirement and tagged NASDAQ:BPY, NYSE:ABBV, NYSE:BNS, TSX:BNS, TSX:BPY.UN on October 31, 2018 by Passive Income Earner. The main content for this article first appeared as 1 of 9 top Canadian dividend ideas for December 2017 in the Seeking Alpha Marketplace service DGI Across North America. Brookfield Property Partners LP (TSX:BPY.UN)(NYSE:BPY) is a reasonably-priced stock in a fully-valued market. Now is an excellent opportunity to buy Brookfield Property (below ~CAD$28 per unit on the Toronto Stock Exchange and at ~US$22 on the New York Stock Exchange) for income. Brookfield Property owns and operates a global portfolio of real estate assets with a focus in North America. It has ~US$152 billion of assets under management, of which ~73% are in North America. Nearly 17% are in the United Kingdom and Europe, ~8% are in Australia and Asia, and <2% are in Brazil. It has 30 offices, around the globe, where it has ~250 investment professionals and ~16,000 operating employees to get the job done. About 80% of its portfolio is in core office and retail assets, which targets total returns of 10-12%. The remainder of the portfolio is in opportunistic investments, which target higher returns of 18-20%. The core portfolio focuses on generating stable cash flows, which help with paying its +5% yield. The opportunistic portfolio aims to invest in mispriced properties in multifamily, industrial, hospitality, triple net lease, self-storage, student housing, and manufactured housing sectors. This entry was posted in Dividend Investing, Investing and tagged NYSE:BPY, TSX:BPY.UN on January 2, 2018 by Passive Income Earner. Are you looking for stable growing income? If so, you should have these stocks on your radar. They offer sustainable yields of 4.5-5.6% with dividend growth potential of at least 5% per year. Algonquin Power & Utilities Corp (TSX:AQN)(NYSE:AQN) has returned about 24.6% on the TSX in the last 12 months. The utility offers a U.S. dollar-denominated dividend which benefits Canadian investors no matter if they opt to receive its dividend in the Canadian or U.S. currency. For U.S. investors, Algonquin offers above-average growth in the relatively stable utility space. Algonquin continues to execute. In Q1, its adjusted earnings per share increased 19% and its assets grew 94% compared to Q1 2016. These are thanks partly to its acquisition of Empire, which added 218,000 new water, gas, and electric utility customers to its portfolio, as well as 1,400 MW of regulated electrical power generation. Algonquin also put in service 210MW of net power generation capacity, of which 160MW has 20 years of power purchase agreements, which implies stable cash flow generation from those facilities. The utility offers an above-average yield with an above-average growth rate. Due partly to the strength of the U.S. dollar, Algonquin yields 4.5% and aims to grow its dividend by 10% a year. Thomson Reuters analysts have a mean 12-month price target of C$14.20 on the stock. So, it’s fairly valued. Investors looking for stable, growing income can consider the shares today. However, weakness in the U.S. dollar will bring the yield down for Canadian investors. Investors looking for a margin of safety should wait until a pullback to at least the low C$13 level. This entry was posted in Dividend Ideas, Dividend Investing and tagged NYSE:AQN, NYSE:BPY, NYSE:STOR, TSX:AQN, TSX:BPY.UN on June 1, 2017 by Passive Income Earner. Great businesses can perform badly sometimes. You need to stick with them until they perform well again, otherwise, you might panic, and sell at a loss. Think about the Canadian banks in the financial crisis of 2008-2009, and think about the quality energy companies such as Exxon Mobil (NYSE:XOM) and Suncor Energy (TSX:SU)(NYSE:SU) after the oil prices fell from US$100 to below US$50 in 2015.